Tibial tuberosity fractures are infrequent fractures affecting physically active adolescents. [1, 2, 3, 4, 5, 6] Activities involving powerful contraction of the knee extensors, such as springing and jumping movements, can result in avulsion fractures of the tibial tuberosity apophysis. [7, 8, 9] This condition should be distinguished from Osgood-Schlatter disease, a chronic apophysitis of the tibial tuberosity due to recurrent traction injury. The extensor complex of the thigh exerts its force through the ligamentum patellae on the tibial tuberosity. During its histogenesis, the tibial tuberosity is an anterior extension of the proximal tibial epiphysis separated from the rest of the tibia by the growth plate. As the growth plate closes in late puberty, it is transiently replaced by fibrocartilaginous elements, which predispose it to traction injury as a result of its weaker tensile strength. 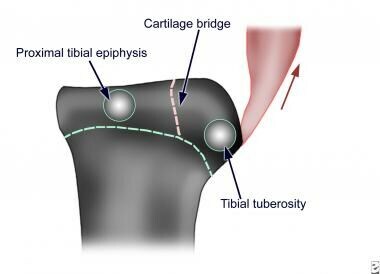 The proximal tibia has two ossification centers, the proximal tibial epiphysis and the tibial tuberosity, which are separated by a cartilage bridge (see the image below). Before ossification, the tibial tuberosity is composed of fibrocartilage that has good tensile strength. However, during ossification, columnated cartilaginous cells with poor tensile strength replace the fibrocartilage, and it is within this small window between fibrocartilage and ossified matrix that the tibial tuberosity is at risk of avulsion fractures. Ossification centers and epiphyseal cartilages of the proximal tibia and tibial tuberosity. As a result of the direction of pull of the patella tendon, the tibial tuberosity along with the proximal tibial epiphysis can be avulsed upward in a fracture in one or more fragments (see the image below). Ogden modified this classification by adding the subtypes A and B,  with A representing single fractures and B representing comminuted fractures. In other words, it occurs when sudden acceleration or deceleration of the extensor mechanism occurs. Patients with Osgood-Schlatter disease may be predisposed to tibial tuberosity fractures. Similarly, patients with these fractures may have a family history of Osgood-Schlatter disease or a history of fractures of the tibial tuberosity. In the United States, the frequency of tibial tubercle fracture has not been determined, though the injury is known to occur infrequently. At one major center, 15 cases of tibial tuberosity fractures were diagnosed in 5 years. Tibial tuberosity fractures typically occur in individuals aged 14-17 years. As the growth plate closes in late puberty, it is transiently replaced by fibrocartilaginous elements. These elements predispose the tibial tuberosity to traction injury as a result of its weakened tensile strength. Internationally, the frequency is not known. As in the United States, the condition occurs infrequently. The most common fracture reported was type III (50.6%). The rate of associated injury was 4.1% overall and was highest for type III fractures (4.7%). ​ Compartment syndrome occurred in 3.57% of cases. ORIF was performed in 98% of surgical cases. Regardless of the type of fracture, 98% of patients were able to regain their preinjury activity and knee range of motion, and 99.4% achieved fracture consolidation. The overall complication rate was 28.3%; removal of an implant because of bursitis (55.8%) was the most common complication, followed by tenderness/prominence (17.9%) and refracture (6.3%). Reuter S, Mellerowicz H. [Acute tibial tubercle avulsion fractures]. Orthopade. 2016 Mar. 45 (3):226-8, 230-2. [Medline]. Buhari SA, Singh S, Wong HP, Low YP. Tibial tuberosity fractures in adolescents. Singapore Med J. 1993 Oct. 34 (5):421-4. [Medline]. Mirbey J, Besancenot J, Chambers RT, Durey A, Vichard P. Avulsion fractures of the tibial tuberosity in the adolescent athlete. Risk factors, mechanism of injury, and treatment. Am J Sports Med. 1988 Jul-Aug. 16 (4):336-40. [Medline]. Nimityongskul P, Montague WL, Anderson LD. Avulsion fracture of the tibial tuberosity in late adolescence. J Trauma. 1988 Apr. 28 (4):505-9. [Medline]. Wiss DA, Schilz JL, Zionts L. Type III fractures of the tibial tubercle in adolescents. J Orthop Trauma. 1991. 5 (4):475-9. [Medline]. Zionts LE. Fractures around the knee in children. J Am Acad Orthop Surg. 2002 Sep-Oct. 10 (5):345-55. [Medline]. Abalo A, Akakpo-numado KG, Dossim A, Walla A, Gnassingbe K, Tekou AH. Avulsion fractures of the tibial tubercle. J Orthop Surg (Hong Kong). 2008 Dec. 16 (3):308-11. [Medline]. Zrig M, Annabi H, Ammari T, Trabelsi M, Mbarek M, Ben Hassine H. Acute tibial tubercle avulsion fractures in the sporting adolescent. Arch Orthop Trauma Surg. 2008 Dec. 128 (12):1437-42. [Medline]. Hanley C, Roche SJ, Chhabra J. Acute simultaneous bilateral avulsion fractures of the tibial tubercles in a 15-year-old male hurler: case report and literature review. Ir J Med Sci. 2011 Jun. 180 (2):589-92. [Medline]. Watson-Jones R. Fractures and Joint Injuries. 6th ed. New York: Churchill Livingstone; 1982. Ogden JA, Tross RB, Murphy MJ. Fractures of the tibial tuberosity in adolescents. J Bone Joint Surg Am. 1980 Mar. 62 (2):205-15. [Medline]. Cohen DA, Hinton RY. Bilateral tibial tubercle avulsion fractures associated with Osgood-Schlatter's disease. Am J Orthop (Belle Mead NJ). 2008 Feb. 37 (2):92-3. [Medline]. Brown MJ, Bisson LJ, Anders MJ. Tibial Tubercle Fracture After Bone-Patellar Tendon-Bone Autograft. Am J Orthop (Belle Mead NJ). 2016 Nov/Dec. 45 (7):E469-E471. [Medline]. [Full Text]. Pretell-Mazzini J, Kelly DM, Sawyer JR, Esteban EM, Spence DD, Warner WC Jr, et al. Outcomes and Complications of Tibial Tubercle Fractures in Pediatric Patients: A Systematic Review of the Literature. J Pediatr Orthop. 2016 Jul-Aug. 36 (5):440-6. [Medline]. Chakraverty JK, Weaver MJ, Smith RM, Vrahas MS. Surgical management of tibial tubercle fractures in association with tibial plateau fractures fixed by direct wiring to a locking plate. J Orthop Trauma. 2009 Mar. 23 (3):221-5. [Medline]. Maroto MD, Scolaro JA, Henley MB, Dunbar RP. 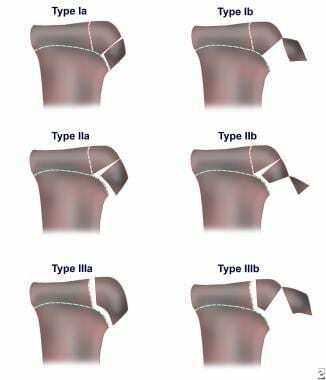 Management and incidence of tibial tubercle fractures in bicondylar fractures of the tibial plateau. Bone Joint J. 2013 Dec. 95-B (12):1697-702. [Medline]. Pesl T, Havranek P. Acute tibial tubercle avulsion fractures in children: selective use of the closed reduction and internal fixation method. J Child Orthop. 2008 Oct. 2 (5):353-6. [Medline]. Tang Y, Zhang YT, Fu QG, Zhang CC, Zhang X, Wang PF. [Application of cannulated compression screws for the treatment of tibial tubercle avulsion fractures of Ogden type III in adolescents]. Zhongguo Gu Shang. 2013 Sep. 26 (9):717-9. [Medline]. Frey S, Hosalkar H, Cameron DB, Heath A, David Horn B, Ganley TJ. Tibial tuberosity fractures in adolescents. J Child Orthop. 2008 Dec. 2 (6):469-74. [Medline]. [Full Text]. Disclosure: Serve(d) as a director, officer, partner, employee, advisor, consultant or trustee for: Orthopediatrics, Inc<br/>Serve(d) as a speaker or a member of a speakers bureau for: Orthopediatrics, Inc<br/>Received income in an amount equal to or greater than $250 from: Orthopediatrics, Inc. The authors and editors of Medscape Drugs & Diseases gratefully acknowledge the contributions of previous coauthor Dr Fergal Monsell to the development and writing of this article.